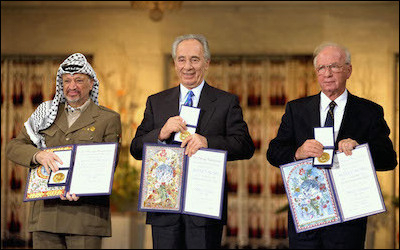 In 1994, (left to right) PLO chairman Yasser Arafat, Israeli prime minister Yitzhak Rabin, and foreign minister Shimon Peres received the Nobel Peace Prize following the signing of the 1993 Oslo accords. But twenty-three years later, peace is still illusive. For Israel, the accords have been the starkest strategic blunder, establishing an ineradicable terror entity on its doorstep, deepening its internal cleavages, and weakening its international standing. Twenty-three years after its euphoric launch on the White House lawn, the Oslo "peace process" between Israel and the Palestine Liberation Organization (PLO) stands out as one of the worst calamities to have afflicted the Israeli-Palestinian conflict. For Israel, it has been the starkest strategic blunder in its history, establishing an ineradicable terror entity on its doorstep, deepening its internal cleavages, destabilizing its political system, and weakening its international standing. For the West Bank and Gaza Palestinians, it has brought subjugation to the corrupt and repressive PLO and Hamas regimes, which reversed the hesitant advent of civil society in these territories, shattered their socioeconomic wellbeing, and made the prospects of peace and reconciliation with Israel ever more remote. This in turn means that, even if the territories were to be internationally recognized as a fully-fledged Palestinian state (with or without a formal peace treaty with Israel), this will be a failed entity in the worst tradition of Arab dictatorships at permanent war with both Israel and its own subjects. "We make peace with enemies," Prime Minister Yitzhak Rabin reassured a concerned citizen shortly after the September 13, 1993 conclusion of the Israel-PLO Declaration of Principles on Interim Self-Government Arrangements (DOP, or Oslo I). "I would like to remind you that the [March 1979] peace treaty with Egypt had many opponents, and this peace has held for 15 years now." True enough. But peace can only be made with enemies who have been either comprehensively routed (e.g., post-World War II Germany and Japan) or disillusioned with the use of violence—not with those who remain wedded to conflict and war. And while Egyptian president Anwar Sadat was a "reformed enemy" eager to extricate his country from its futile conflict with Israel, Yasser Arafat and the PLO leadership viewed the Oslo process not as a springboard to peace but as a "Trojan Horse" (in the words of prominent PLO official Faisal Husseini) designed to promote the organization's strategic goal of "Palestine from the [Jordan] river to the [Mediterranean] sea"—that is, a Palestine in place of Israel. Arafat admitted as much five days before signing the accords when he told an Israeli journalist, "In the future, Israel and Palestine will be one united state in which Israelis and Palestinians will live together"—that is, Israel would cease to exist. And even as he shook Rabin's hand on the White House lawn, the PLO chairman was assuring the Palestinians in a pre-recorded, Arabic-language message that the agreement was merely an implementation of the organization's "phased strategy" of June 1974. This stipulated that the Palestinians would seize whatever territory Israel surrendered to them, then use it as a springboard for further territorial gains until achieving the "complete liberation of Palestine." I know that you are opposed to the Oslo accords, but you must always remember what I'm going to tell you. The day will come when you will see thousands of Jews fleeing Palestine. I will not live to see this, but you will definitely see it in your lifetime. The Oslo accords will help bring this about. 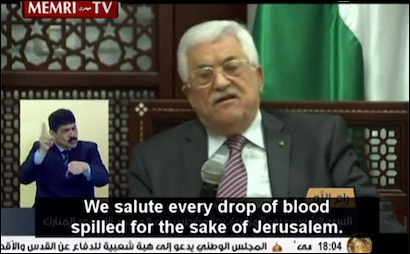 This perfidy was sustained by Arafat's successor, Mahmoud Abbas, who has had no qualms about reiterating the vilest anti-Semitic calumnies: In his June 2016 address to the European Parliament, Abbas accused Israeli rabbis of urging the poisoning of Palestinian water. In his doctoral dissertation, written at a Soviet university and subsequently published in book form, he argued that fewer than a million Jews had been killed in the Holocaust, and that the Zionist movement colluded in their slaughter. He has vowed time and again never to accept the idea of Jewish statehood, most recently in March 2014, when he rallied the Arab League behind his "absolute and decisive rejection to recognizing Israel as a Jewish state," and in September 2015, when he derided Israel in his U.N. address as "a historic injustice ... inflicted upon a people ... that had lived peacefully in their land." An unreconstructed Holocaust denier, PA president Mahmoud Abbas has voiced incessant anti-Semitic and anti-Israel incitement. In his June 2016 address to the European Parliament, Abbas accused Israeli rabbis of urging the poisoning of Palestinian water. He has pledged to prevent the Jews from "defiling al-Aqsa with their filthy feet" and has vowed time and again never to accept the idea of Jewish statehood. Back home in the PA, Abbas was even more forthright, pledging to prevent the Jews from "defiling al-Aqsa with their filthy feet" and stating that "every drop of blood that has been spilled in Jerusalem is holy blood as long as it was for Allah." When this incitement culminated in a sustained wave of violence that killed scores of Israelis in a string of stabbings, car rammings into civilians, and shooting attacks, Abbas applauded the bloodshed as a "peaceful, popular uprising. ... We have been under occupation for 67 or 68 years [i.e., since Israel's establishment]," he told his subjects in March 2016. "Others would have sunk into despair and frustration. However, we are determined to reach our goal because our people stand behind us." In other words, more than two decades after the onset of the Oslo process, Israel's "peace partner" would not even accept the Jewish state's right to exist, considering its creation an "illegal occupation of Palestinian lands." What makes this state of affairs all the more tragic is that, at the time of the Oslo accords, the Rabin government had a potentially far better peace partner in the form of the West Bank and Gaza leadership. To be sure, Israel's hand-off policies during the two-and-a-half decades from the June 1967 capture of the territories to the onset of the Oslo process enabled the PLO to establish itself as the predominant force there at the expense of the more moderate local leadership. But this meant no blind subservience to the organization's goals or means. Unlike the PLO's diaspora constituents (or the "outside" in Palestinian parlance) who upheld the extremist dream of returning to their 1948 dwellings at the cost of Israel's destruction, West Bankers and Gazans (the "inside") were amenable to peaceful coexistence that would allow them to get on with their lives and sustain the astounding economic boom begun under Israel's control. During the 1970s, for example, the West Bank and Gaza were the fourth fastest-growing economy in the world, ahead of such "wonders" as Singapore, Hong Kong, and Korea, making socioeconomic conditions there far better than in most neighboring Arab states. While the "outside" diaspora had no direct interaction with Israelis (and for that matter with any other democratic system), Israel's prolonged rule had given the "inside" Palestinians a far more realistic and less extreme perspective: hence their perception of Israel as more democratic than the major Western nations; hence their overwhelming support for the abolition of those clauses in the Palestinian charter that called for Israel's destruction and their rejection of terror attacks; and hence their indifference to the thorniest issue of the Palestinian-Israeli dispute, and the one central to the PLO's persistent effort to destroy Israel, namely, the "right of return." As late as March 1999, two months before the lapse of the official deadline for the completion of the Oslo final-status negotiations, over 85 percent of respondents did not consider the refugee question the most important problem facing the Palestinian people. The PLO had been ostracized by its Arab peers following its support for Iraq's brutal occupation of Kuwait. Against this backdrop, the Rabin government had a unique opportunity to steer the Palestinian populace in the West Bank and Gaza in the direction of peace and statehood, possibly in collaboration with Jordan's King Hussein, who just a few years earlier had thrown his hat in the ring only to be rebuffed by Prime Minister Shamir. In a Nablus public opinion poll shortly before the DOP signing, 70 percent of respondents preferred Hussein to the PLO as their sovereign, not least since the PLO had been totally ostracized by its Arab peers following its support for Iraq's brutal occupation of Kuwait. At that point, its prestige in the territories was at one of its lowest ebbs; Hamas was at an early stage of development; the radical Arab regimes were thoroughly disorientated by the collapse of their communist backers; and the West Bank and Gaza leadership was bent on participating in the U.S.-sponsored peace talks between Israel and its neighbors, launched at the October 1991 Madrid Conference and sustained in Washington, against the PLO's adamant objection. But then, instead of seizing the moment and opting for the obvious peace partner that was far better attuned to the needs and wishes of the local Palestinian populace, and against his personal inclination to strike a deal with the "moderate insiders" rather than the "extremist Tunis people [i.e., PLO leadership]," Rabin was persuaded by Foreign Minister Shimon Peres and his deputy Yossi Beilin (who reportedly collaborated with the PLO in obstructing the Washington talks) into surrendering the West Bankers and Gazans to an unreconstructed terror organization whose leader would not hang up his ubiquitous battledress, not even for the signing ceremonies of the various Oslo accords or the receipt of the Nobel Peace Prize, and who used peace as a strategic deception aimed at promoting the eternal goal of Israel's destruction. As a result, twenty-three years of 1) incessant hate mongering by the PLO/PA (not to mention Hamas, which exploited the Oslo process to become the preeminent military and political factor in the territories); 2) countless terror attacks (including a full-fledged terror war, euphemistically named "al-Aqsa Intifada" after the Jerusalem mosque); 3) three protracted large scale military encounters between Hamas and Israel; and 4) economic collapse induced by the PA's and Hamas's corrupt and inept rule have thoroughly radicalized the West Bank and Gaza populace with a new generation of Palestinians brought up on vile anti-Jewish (and anti-Israel) incitement unparalleled in scope and intensity since Nazi Germany. Apart from making the prospects of peace and reconciliation ever more remote, the Oslo process substantially worsened Israel's security position. At the heart of the DOP lay the conviction that it would end three decades of PLO violence and transform the organization overnight from one of the world's most murderous terror groups into a political actor and state builder. As Oslo's chief architect, Yossi Beilin, confidently prophesied shortly after the DOP signing, "The greatest test of the accord will not be in the intellectual sphere. Rather, it will be a test of blood." This chilling prediction was put to the test in short order as terrorism in the territories spiraled to its highest level since Israel took control following the June 1967 Six-Day War. In the two-and-a-half years from the signing of the DOP to the fall of the Labor government in May 1996, 210 Israelis were murdered—nearly three times the average death toll of the previous twenty-six years when only a small fraction of the fatalities had been caused by West Bank- or Gaza-originated attacks. Moreover, nearly two thirds of the 1994-96 victims were murdered in Israeli territory inside the "Green Line"—nearly ten times the average fatality toll in Israel in the preceding six violent years of the Palestinian uprising (intifada). Israeli soldiers patrol Nablus during Operation Defensive Shield. Following the signing of the Oslo accords, the Palestinians have engaged Israel in a near constant state of war and terror, including hundreds of terror attacks in Israeli cities, a full-fledged terror war (the "al-Aqsa intifada"), and three protracted large scale military encounters between Hamas and Israel. In September 1996, Arafat escalated the conflict and crossed another threshold when he reverted to direct violence by exploiting the opening of a new exit to an archaeological tunnel under the Western Wall, Judaism's holiest site, to unleash widespread riots (labeled the "tunnel war") in which 17 Israelis and some 80 Palestinians were killed. And while the PA quickly dropped the tunnel issue from its agenda once it had outlived its usefulness, Arafat was to repeat this precedent on several occasions, most notably by launching the September 2000 terror war (al-Aqsa intifada) a short time after being offered Palestinian statehood by Israel's prime minister Ehud Barak. By the time of Arafat's death four years later, his war—the bloodiest and most destructive confrontation between Israelis and Palestinians since 1948—had exacted 1,028 Israeli lives in some 5,760 attacks—nine times the average death toll of the pre-Oslo era. Of these, about 450 people (or 43.8 percent of victims) were killed in suicide bombings—a practically unheard of tactic in the Palestinian-Israeli context prior to Oslo. The only pre-Oslo suicide bombing, in which one local Palestinian and the two bombers were killed, took place in April 1993 in the desolate Jordan Valley, outside the pre-1967 line. All in all, more than 1,600 Israelis have been murdered and another 9,000 wounded since the signing of the DOP—nearly four times the average death toll of the preceding twenty-six years. It was Hamas, rather than the PLO, which was to bring Arafat's genocidal vision for Israel to fruition. But the story does not end here. For underlying this bloodletting was the transformation of the territories into unreconstructed terror bastions in line with Arafat's vision of making them a springboard of "a popular armed revolution" that would "force the Zionists to realize that it is impossible for them to live in Israel." Only it was Hamas, the Palestinian branch of the Muslim Brotherhood, which made its debut during the 1987-93 intifada, rather than the PLO, which was to bring Arafat's genocidal vision to fruition. With its initial fears of repression by the newly-installed PA quickly assuaged, Hamas waged a sustained terror campaign (with Arafat's tacit approval) that exerted a devastating impact on the nascent peace process. Its March 1996 murder of 58 Israelis in the span of one week, for example, was instrumental in Benjamin Netanyahu's electoral defeat of Prime Minister Peres two months later. But Hamas also reached an agreement with the PLO/PA on the continuation of these attacks provided they did not emanate from territories under the latter's control. Collaboration between the two organizations reached its zenith during the "al-Aqsa intifada" when Hamas played the leading role, especially in the field of suicide bombings, carrying out the deadliest and most horrific attacks inside Israel. And while Israel managed to destroy the West Bank's terror infrastructure in a sustained counterinsurgency effort, Hamas managed to retain its Gaza base largely intact despite the targeted killing of many of its top leaders, including founding father Ahmad Yasin and his immediate successor Abdul Aziz Rantisi. Moreover, by way of compensating for its dwindling capacity for suicide bombings—which dropped from sixty in 2002 to five in 2006—the Islamist terror group reverted to massive high trajectory attacks from Gaza. In 2004, 309 home-made Qassam rockets and 882 mortar shells were fired on Israeli villages in the Strip and towns and villages within Israel (compared to 105 and 514 respectively in 2003), and the following year saw 401 and 854 respective attacks despite Hamas's acceptance of a temporary suspension of fighting. This left little doubt among Palestinians as to who spearheaded the "armed struggle" against Israel, and when, in the summer of 2005, the Israeli government unilaterally vacated the dozen odd villages in the south of the Strip with their 8,000-strong population, the move was widely considered a Hamas victory. A few months later, on January 25, 2006, the organization reaped the political fruits of its military prowess when, in its first electoral showing since the DOP (it boycotted the first parliamentary elections in 1996), it scored a landslide victory winning 74 of parliament's 132 seats. As the PLO/PA would not accept this reality, in 2007, relations between the two groups deteriorated into violent clashes, especially in Gaza, with scores of people killed and many more wounded as Hamas seized full control of the Strip. 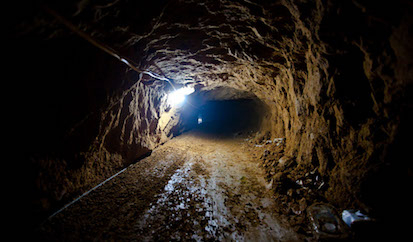 Smuggling tunnel in Rafah. Following the withdrawal of Israeli forces from the Philadelphi patrol route along the Gaza Strip's border with Egypt, Hamas embarked on a massive buildup of its terror infrastructure. By 2008, Hamas was launching ten rockets, missiles, and mortar shells into Israel a day. Flushed with success and encouraged by the withdrawal of Israeli forces from the Philadelphi patrol route along the Strip's border with Egypt, Hamas embarked on a massive buildup of its terror infrastructure with vast quantities of weapons and war matériel smuggled from Sinai through an extensive and rapidly expanding underground tunnel system. Within a year of Israel's unilateral withdrawal, there was a fourfold increase in the number of rockets and missiles fired from the Strip (from 401 to 1,726); and while this pace ebbed slightly in 2007 (to 1,276 attacks), it peaked to a whopping 2,048 attacks in 2008 (in addition to 1,668 mortar shells), or ten attacks a day. In an attempt to stem this relentless harassment of its civilian population, in December 2008-January 2009, Israel launched a large ground operation in Gaza (codenamed Cast Lead). But while the operation eroded Hamas's military capabilities and led to a vast decrease in the firing of rockets and missiles, it failed to curb the organization's military might and political ambitions. In the ensuing five years, Israel was forced to fight two more inconclusive wars against the Islamist group—Operation Pillar of Defense (November 14-21, 2012) and Operation Protective Edge (July 8-August 26, 2014). And to add insult to injury, it was Israel, rather than Hamas, that came under scathing international censure for its supposed use of "disproportionate force," including two major U.N. fact-finding reports and a string of indictments by humanitarian organizations. In December 2014—a mere four months after Hamas had criminally subjected millions of Israelis to sustained rocket and missile attacks for seven full weeks—the European Court of Justice removed the group from the EU's list of terrorist organizations. Since no theme has dominated the discourse of the Palestinian-Israeli conflict more than Israel's "illegitimate occupation of Palestinian lands," it was believed by the Oslo architects that by ceding control of the territories' population, Israel would be able to quiet the chorus of criticism and to boost its international standing. We have been freed of a heavy burden. I never believed in the possibility of an enlightened occupation. It was necessary to lift that burden so as to avoid becoming a target for organizations throughout the world that viewed us as oppressors. 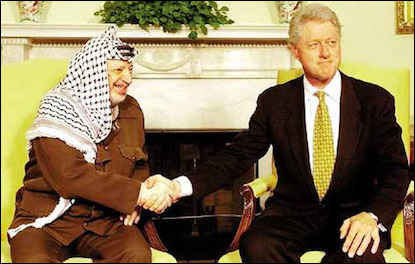 During Bill Clinton's eight years in office, Arafat (left) was welcomed to the White House more often than any other world leader. The EU, for its part, stuck with the PLO leader, disregarding PLO/PA excesses and growing disillusionment in the West Bank and Gaza with Arafat's repressive and corrupt leadership. In fact, not only did Israel get no credit whatsoever for its withdrawal from the territories, but this move went virtually unnoticed by the international community while the PLO surged to unprecedented international heights—without shedding its genocidal commitment to Israel's destruction, surrendering its weapons, or abandoning its terrorist ways. So much so that during Bill Clinton's eight years in office, Arafat was welcomed to the White House more often than any other world leader; he even happened to be seated opposite the U.S. president when he was first questioned about his affair with Monica Lewinsky. Within five years from the signing of the DOP, the PA had received $2.5 billion of the pledged $3.6 billion in international aid, apart from some $600 million contributed to activities in the West Bank and Gaza through the U.N. Relief and Works Agency for Palestine Refugees in the Near East (UNRWA); by 2016, the United States alone had committed more than $5 billion in bilateral economic aid to the Palestinians. But then, rather than use their formidable economic leverage to pressure the PLO/PA to abide by its peace obligations, the donor states turned a blind eye both to Arafat's condoning of proxy terrorism (by Hamas and the Islamic Jihad) and to his direct use of violence. Not only did his launch of a terror war shortly after being offered statehood by Barak fail to attract international criticism, it boosted the PLO/PA's standing and boxed Israel into a corner. Media outlets, commentators, and politicians throughout the world blamed the premeditated Palestinian violence on the supposed "provocation carried out at al-Haram al-Sharif in Jerusalem on 28 September 2000 [i.e., Ariel Sharon's visit to Temple Mount]," to use the words of a special Security Council resolution, which the United States failed to veto. Even President Clinton, who two months earlier had publicly chided Arafat for failing to seize Barak's generous offer of statehood, swiftly changed tack and pressured the Israeli government for further concessions (which it made), only to be rebuffed yet again by the Palestinian leader. The European Union became the PA's foremost international backer as the terror war against Israel escalated. For its part, the European Union became the PA's foremost international backer as the terror war escalated. Making no distinction between terror attacks and counterinsurgency measures aimed at their deflection, it blamed both sides for the continuation of violence, criticized Israel at every turn, and increased financial aid to the Palestinians despite the incontrovertible evidence that much of this aid was being channeled to terror activities: In 2001-04, international disbursements doubled from an annual average of $500 million to over $1 billion as Arafat's terror war plunged the territories into dire economic straits. Disregarding both the PLO/PA excesses and the growing disillusionment in the West Bank and Gaza with Arafat's repressive and corrupt leadership, the EU stuck with the PLO leader to his dying day, jeopardizing President George W. Bush's attempt to bring about "a new and different Palestinian leadership ... not compromised by terror." So did the International Court of Justice, the principal judicial organ of the United Nations, which condemned Israel's attempt to stem the tidal wave of suicide bombings through the construction of a security barrier between its territory and the West Bank as "contrary to international law." The PLO painted Israel as the main obstacle to peace despite Jerusalem's consistent supportfor the two-state solution. The solemn pledge by Abbas to persist in his predecessor's (violent and corrupt) path failed to impress the Palestinians' international backers as evidenced among other things by their indifference to the disappearance of $3.1 billion worth of aid between 2008 and 2012; to his abstention from disarming the terror groups operating under his jurisdiction as required by the Oslo accords; and to his refusal to hold new elections upon the expiry of his presidency in January 2009. Nor was Abbas's supposed interest in peace questioned despite his categorical rejection of the idea of Jewish statehood (the root cause of the decades-long failure of the two-state solution); his incessant anti-Semitic and anti-Israel incitement; and his abandonment of the bilateral peace talks in search of an internationally imposed Palestinian state—without a peace agreement. On the contrary, with Barack Obama determined to put the maximum "daylight" between Washington and Jerusalem, the U.S. administration not only snubbed the Israeli government as a matter of course but exploited blatant anti-Israel activities (e.g., the international chorus of condemnation attending the May 2010 Mavi Marmara incident) to tighten the political noose around Jerusalem. Israeli prime minister Benjamin Netanyahu's attempt to break the stalemate by agreeing in June 2009 to the creation of a Palestinian state and imposing in November 2009 a 10-month freeze on Jewish construction activities in the West Bank failed to impress the Palestinians. Dismissing his gestures out of hand, they walked away from the negotiating table upon the expiry of the construction moratorium and sought to present Israel with a fait accompli by gaining U.N. recognition of Palestinian statehood—in flagrant violation of the Oslo accords that envisaged the attainment of peace through direct negotiations between the two parties. Having failed to garner sufficient support at the Security Council, in November 2012, they obtained General Assembly recognition of Palestine as a "non-member observer state," following which the PA set out to join a string of international bodies and agencies, most importantly the International Criminal Court (ICC). On January 2, 2015, the "State of Palestine" acceded to the Rome statute, the ICC's founding treaty, and two weeks later, the court opened a preliminary examination into "the situation in Palestine," having received jurisdiction over alleged crimes committed "in the occupied Palestinian territory, including East Jerusalem, since June 13, 2014." Nine months later, on September 30, fresh from yet another anti-Israel diatribe, Abbas joined Secretary-General Ban Ki-moon for an official ceremony in which the Palestinian flag was raised for the first time outside the U.N.'s headquarters in New York. The significance of these developments cannot be overstated. Twenty-four years after its exclusion from the U.S.-orchestrated international peace talks in Madrid and its wall-to-wall ostracism by its Arab peers, the PLO had recast itself in the eyes of the international community as the legitimate, peaceable, and democratically-disposed ruler of the prospective Palestinian state against all available evidence to the contrary, painting Israel as the main obstacle to peace despite its surrender of control of the territories' population and consistent support for the two-state solution. In addition, the former terrorist group had laid the groundwork for Israel's international indictment for supposed "war crimes" and "crimes against humanity." And all this transpired without the PLO/PA accepting the Jewish state's right to exist as stipulated by the United Nations sixty-eight years earlier and while remaining committed to Israel's eventual demise. The Oslo process has confronted Israel with the likely creation of a revanchist Palestinian state committed to its destruction (whether tacitly as in the case of the PLO/PA or overtly as with Hamas) and imposed severe constraints on Jerusalem's international maneuverability and capacity for self-defense. But the process has also dealt a devastating blow to the delicate edifice of Jewish-Arab relations within Israel—not that the PLO had previously refrained from meddling in the affairs of the Israeli Arabs. Yet the Oslo process raised this involvement to a qualitatively different level for the simple reason that by recognizing the PLO as "the representative of the Palestinian people," the Rabin government effectively endorsed its claim of authority over a substantial number of Israeli citizens and gave it a carte blanche to interfere in Israel's domestic affairs. Such a concession would be problematic even under the most auspicious circumstances; made to an irredentist party still officially committed to the destruction of its "peace partner," it proved nothing short of catastrophic. Decades of incitement and radicalization following Oslo have had a palpable effect on Arab-Jewish relations in Israel. Arab Israeli leaders have openly identified with Israel's sworn enemies, and Israeli Arabs have rioted often in reaction to Israeli attempts to stop Palestinian terrorism. As the PLO seized its newly-gained opportunity with alacrity, open identification of Israeli Arab leaders with the country's sworn enemies became commonplace with many visiting the neighboring Arab states—from Syria, to Lebanon, to Libya, to Yemen—to confer with various heads of the "resistance movement" and to urge anti-Israel terror activities. As the 1990s wore on, open calls for Israel's destruction substituted for the euphemistic advocacy of this goal. Azmi Bishara, founding leader of the ultranationalist Balad party, predicated on the demand for "a state of all its citizens"—the standard euphemism for Israel's transformation into an Arab state in which Jews would be reduced to a permanent minority—began comparing the Jewish state's fate to that of the crusading states. He fled the country in 2006 to avoid prosecution for treason, having allegedly assisted Hezbollah during its war with Israel in the summer of that year. His successor, Jamal Zahalka, preferred a more contemporary metaphor, claiming that just as South Africa's apartheid had been emasculated, so its Zionist counterpart had to be destroyed. And Sheikh Raed Salah, leader of the northern branch of the Islamic Movement in Israel, who never tired of crying wolf over Israel's supposed designs on the al-Aqsa mosque, prophesied the Jewish state's demise within two decades should it not change its attitude to the Arab minority. Even the "national committee of the heads of local Arab municipalities in Israel," the effective leadership of the Israeli Arabs, issued a lengthy document outlining its "Future Vision for the Palestinian Arabs in Israel," which derided Israel as "a product of colonialist action initiated by the Jewish-Zionist elites in Europe and the West"; rejected Israel's continued existence as a Jewish state, and demanded its replacement by a system that would ensure Arab "national, historic and civil rights at both the individual and collective levels." Most Arabs would rather remain Israeli citizens, knowing that life in a democratic society is preferable to that in the prospective Palestinian state. It is true that most Arabs would rather remain Israeli citizens, knowing full well that life in a civil, democratic, and pluralistic society, albeit a Jewish one, is preferable to what will be on offer in the prospective Palestinian state. Yet the Oslo decades of incitement and radicalization have had a palpable effect on Arab-Jewish relations in Israel. When, in February 1994, a Jewish fanatic murdered twenty-nine Muslims at prayer in Hebron, large-scale riots erupted in numerous Arab settlements throughout Israel with mobs battling police for four full days. The scenario repeated itself in April 1996 when dozens of Lebanese Shiites were mistakenly killed in an Israeli bombing of terrorist targets in south Lebanon, and yet again in September 1996, during the Jerusalem tunnel riots, reaching an unprecedented peak on October 1, 2000, when the Israeli Arabs turned on their Jewish compatriots—in support of an external attack on their own state (i.e., the "al-Aqsa Intifada."). Small wonder that commemoration of the October 2000 riots has often been accompanied by violence, at times coordinated with the PA, as have Israel's defensive measures against Palestinian terrorism. 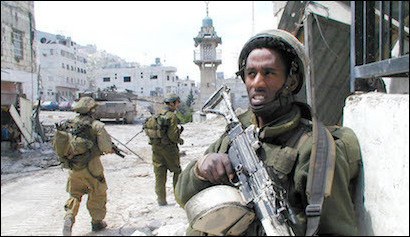 When on March 29, 2002, the Israel Defense Forces launched Operation Defensive Shield against the terror infrastructure in the West Bank, violent demonstrations broke out in Arab settlements throughout Israel, and the Arab-Israeli Islamist movement initiated widespread activities in support of the West Bank Palestinians. Similar outbursts of violence occurred in December 2008-January 2009 when Israel moved to end years of rocket and missile attacks on its towns and villages (Operation Cast Lead) from Hamas-controlled Gaza. However dramatic, the radicalization of its Arab citizens has not been Israel's worst Oslo-related domestic debacle; far more significant has been the destabilization of the country's political system from which it has not recovered to date. In the twenty-three years from the signing of the DOP, just one of the nine reigning Israeli governments completed its four-year tenure with one term ended by the unprecedented assassination of the incumbent prime minister. Meanwhile, parliament's average duration dropped from 3.6 years to 3 years, and an unprecedented number of parties were formed, torn apart, and disbanded. To be sure, Israel's diverse political system has seen the rise and fall of sectorial parties from the early days of statehood; yet the proliferation of "atmosphere parties" thriving on the general yearning for change while effectively servicing their founders' political ambitions, skyrocketed to new heights during the Oslo years as the cognitive dissonance between realization of Palestinian perfidy and the lingering longing for peace drove many Israelis to cling to the latest celebrity hope peddler to emerge on the political scene. Thus the nascent Third Way Party won four of the Knesset's 120 seats in 1996, only to evaporate into thin air three years later. It was followed by the similarly disposed Center Party, which won six seats in 1999 before disappearing from the political scene in the 2003 elections when another one-term party—One People—came into brief and unremarkable existence. The Shinui (Change) party, a splinter of the one-term Democratic Movement for Change (DASH) that played a key role in Likud's 1977 historic ascendance, managed to win six and fifteen seats in the 1999 and 2003 elections respectively, before vanishing altogether in 2006. Its unhappy fate was replicated by the Kadima party, established by a string of prominent Likud and Labor defectors headed by Prime Minister Ariel Sharon, which managed to form a government in 2006 and win the 2009 elections by the slimmest of margins (though it was Likud that eventually formed a government), before fading into oblivion in the 2013 elections. So did Hatenua party, formed by Likud-defector-turned-Kadima-refugee Tzipi Livni, which was amalgamated with Labor in the 2015 elections. It remains to be seen for how long the Yesh Atid party, which made an impressive debut in 2013 (19 seats, dropping to 11 in 2015) and is headed by television personality Yair Lapid, or the Kulanu Party, which entered the political fray in 2015 (10 seats) and is led by Likud defector Moshe Kahlon, will survive, identified as they are with their founders' personal fortunes. Yet the detrimental effects of these parties, as well as those of their many failed precursors and likely successors, are bound to haunt Israel's political system and the country's governability for years to come. A dozen Palestinian Authority security and intelligence services all answered directly to Arafat. They supported Arafat's repression of his Palestinian subjects and his terror war against Israel and secured extensive protection and racketeering networks. International relations are rarely a zero-sum game where one's loss is necessarily the other's gain, and the Oslo process has been no exception to this rule. Not only have its massive Israeli setbacks not been translated into direct Palestinian gains, but the Palestinian population of the West Bank and Gaza (and Palestinian Diaspora communities for that matter) has paid a heavy price for its leaders' perennial disinterest in statehood and obsession with violence. Just as these leaders' rejection of the November 1947 partition resolution and the waging of a war of annihilation against their Jewish neighbors led to the collapse and dispersal of Palestinian society, so the use of Oslo as a tool for anti-Israeli activities and domestic repression rather than the vehicle for peace and state-building it was meant to be has made these long overdue goals ever more remote, plunging relations between the two parties to their lowest ebb since 1948. For all his rhetoric about Palestinian independence, Arafat had never been as interested in the attainment of statehood as in the violence attending its pursuit. In the late 1970s, he told his close friend and collaborator, the Romanian dictator Nicolae Ceausescu, that the Palestinians lacked the tradition, unity, and discipline to become a formal state, and that a Palestinian state would be a failure from the first day.Once given control of the Palestinian population in the West Bank and Gaza as part of the Oslo process, Arafat made this bleak prognosis a self-fulfilling prophecy, establishing a repressive and corrupt regime where the rule of the gun prevailed over the rule of law and where large sums of money donated by the international community for the benefit of the civilian Palestinian population were diverted to funding racist incitement, buying weaponry, and filling secret bank accounts. 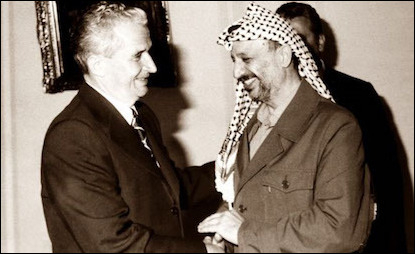 Arafat told his friend and collaborator, the Romanian dictator Nicolae Ceausescu (left), that the Palestinians lacked the tradition, unity, and discipline to become a formal state, and that a Palestinian state would be a failure from the first day. Arafat was true to his word. 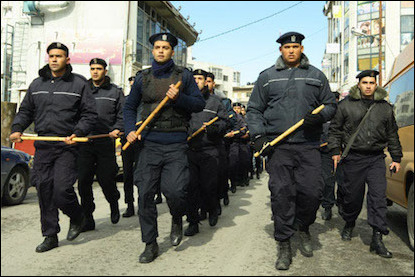 Within a short time of its creation, the Palestinian Authority had literally become the largest police state in the world with one policeman for every forty residents—four times as many as in Washington, D.C., the American city with the highest number of law enforcement officers per capita. Backed by a dozen security and intelligence services, all answering directly to Arafat, these forces were ostensibly designed to enforce law and order and to combat anti-Israel terrorism. In reality, they served as Arafat's repressive tool over his Palestinian subjects, as an instrument of terror against Israel, and as guardian of the extensive protection and racketeering networks that sprang up in the territories under the PA's control while the national budget was plundered at will by PLO veterans and Arafat cronies. In May 1997, for example, the first-ever report by the PA's comptroller stated that $325 million, out of the 1996 budget of $800 million had been "wasted" by Palestinian ministers and agencies or embezzled by officials. Though this breathtaking corruption played an important role in Hamas's landslide electoral victory of January 2006, the PLO/PA leadership seems to have learned nothing and to have forgotten nothing. For one thing, Abbas sustained his predecessor's repressive regime, blatantly ignoring the results of the only (semi) democratic elections in Palestinian history by establishing an alternative government to the legally appointed Hamas government (which he unsuccessfully sought to topple through the denial of international funding) and by refusing to hold new elections upon the expiry of his presidency in January 2009. For another, he seems to have followed in Arafat's thieving footsteps, reportedly siphoning at least $100 million to private accounts abroad and enriching his sons at the PA's expense while blocking the timid reform efforts of his appointed prime minister, Salam Fayyad, and eventually forcing him out of office. Under the PA's control, the national budget was plundered at will by PLO veterans and Arafat cronies. In these circumstances, it was hardly surprising that the well-being of the West Bank/Gaza population has ebbed dramatically during the Oslo years. At the time of the DOP signing, and despite the steep economic decline in the six years of the intifada (1987-93), socioeconomic conditions in the territories were far better than in most neighboring Arab states after two decades of constant expansion under Israeli control that saw a tenfold rise of the per-capita gross domestic product. As late as September 2000 when Arafat launched his war of terror, Palestinian income per capita was nearly double Syria's, more than four times Yemen's, and 10 percent higher than Jordan's (one of the better off Arab states) despite the steady deterioration of the West Bank and the Gaza economies under the PA's control. By the time of Arafat's death in November 2004, however, his terror war had slashed this income to a fraction of its earlier levels, with real GDP per capita some 35 percent below pre-September 2000 levels, with unemployment more than doubling and most Palestinians reduced to poverty and despondency. And while Israel's suppression of the terror war generated a steady recovery with the years 2007-11 recording an average yearly growth above 8 percent, by mid-2014, a full-blown recession had taken hold in the territories with the growth rate dropping to minus 1 percent (0.5 percent in the West Bank and -4 percent in Gaza), a quarter of the population living in poverty (with rates in Gaza twice as high as in the West Bank), and unemployment soaring to over a quarter of the workforce. Twenty-three years and thousands of deaths after the launch of the Oslo "peace process," one might have hoped that the international community would begin to realize that the Palestinian leadership is as implacably opposed to the two-state solution as its predecessor was to the U.N.'s endorsement of the idea sixty-nine years ago. But that is evidently a pipe dream. Just as President Clinton, whose hope of brokering a Palestinian-Israeli peace was dashed by Arafat in the July 2000 Camp David summit and again in December of the same year, and who blamed the PLO leader for the collapse of the Oslo process, could suggest five months before Arafat's death that the United States and Israel had no choice but to resume negotiating with the PLO/PA leader, so the EU has recently endorsed a French plan for an international peace conference in total disregard of Abbas's adamant rejection of Israel's right to exist. This soft racism—asking nothing of the Palestinians as if they are too dim or too primitive to be held accountable for their own words and actions—is an assured recipe for disaster. For it is the total absence of accountability from Middle Eastern political life that has allowed a long succession of local dictators, from Gamal Abdel Nasser, to Saddam Hussein, to Yasser Arafat, to Bashar al-Assad, to inflict recurrent disasters and endless suffering on their peoples and mayhem on the world. So long as policies and actions on the Palestinian side are permitted, or encouraged, to remain as they are, there will be no progress whatsoever toward peace: not in the framework of a Paris international conference, not even in bilateral talks, were the Palestinians to be somehow coerced to return to the negotiating table. Just as the creation of free and democratic societies in Germany and Japan after World War II necessitated a comprehensive socio-political and educational transformation, so it is only when Palestinian society undergoes a real "spring" that will sweep its corrupt and oppressive PLO and Hamas rulers from power, eradicate the endemic violence from political and social life, and value the virtues of coexistence with their Israeli neighbors, that the century-long conflict between Arabs and Jews can at long last be resolved. Sadly, this possibility, which seemed to be in the offing in 1993, has been eliminated for the foreseeable future by the Oslo "peace process." Efraim Karsh, editor of the Middle East Quarterly, is emeritus professor of Middle East and Mediterranean studies at King's College London and professor of political studies at Bar-Ilan University where he also directs the BESA Center for Strategic Studies. This article is part of a wider study prepared under the auspices of the BESA Center. Roy Mandel, "'Shalom osim im oivim: mikhtavim shekatav lanu Rabin," Ynet (Tel Aviv), Oct. 18, 2010. Faisal Husseini, interview with al-Arabi (Cairo), June 24, 2000. Ha'olam Ha'ze (Tel Aviv), Sept. 8, 1993. Palestinian Media Watch (PMW), "Al-Quds al-Arabi editor-in-chief: Arafat planned that Oslo would chase away Israelis," Sept. 3, 2015. Haaretz (Tel Aviv), June 23, 2016. Mahmoud Abbas, al-Wajh al-Akhar: al-Alaqat as-Sirriya bayna an-Naziya wa-l-Sihyuniya (Amman: Dar Ibn Rushd, 1984). WAFA (PLO/PA official news agency), Sept. 30, 2015. Al-Hayat al-Jadida (Ramallah, official PA daily), Sept. 17, 2015, PMW. "Mahmoud Abbas: Murdering Israelis is 'peaceful popular uprising,'" PMW, Dec. 1, 2015; "Abbas: All of Israel Is Occupation," official PA TV, Mar. 11, 2016, PMW, Apr. 6, 2016. "Public Opinion Poll No. 31—Part I: On Palestinian Attitudes towards Politics," Jerusalem Media and Communications Center, Mar. 1999, p. 3. Mohamed Heikal, Secret Channels: The Inside Story of Arab-Israeli Peace Negotiations (London: Harper Collins, 1996), p. 450. See, for example, Pinhas Inbari, Beharavot Shvurot (Tel Aviv: Misrad Habitahon, 1994), chap. 18-23. See, for example, Mamduh Nawfal, Qisat Ittifaq Uslu: ar-Riwaya al-Haqiqiya al-Kamila, (Amman: al-Ahliya, 1995), pp. 61-3; Efraim Sneh, Nivut Beshetach Mesukan (Tel Aviv: Yediot Ahronot, 2002), pp. 22-3; Adam Raz, "Hazitot Mitnagshot: Haanatomia 'Hamuzara' shel Hakhraat Oslo shel Rabin," Israelim, Autumn 2012, pp. 107-9. Beilin, interview with Maariv (Tel Aviv), Nov. 26, 1993. "Fatal Terrorist Attacks in Israel, Sept. 1993-1999," Israel Ministry of Foreign Affairs (MFA), Jerusalem, Sept. 24, 2000; "Terrorism Deaths in Israel—1920-1999," idem, Jan. 1, 2000; Wm. Robert Johnston, "Chronology of Terrorist Attacks in Israel: Introduction," Johnston's Archive, Jan. 8, 2016; "Global Terrorism Database," National Consortium for the Study of Terrorism and Responses to Terrorism, University of Maryland, College Park, Md., accessed July 6, 2016. Thus, for example, the May 1972 Lod (now Ben-Gurion) airport massacre, in which 26 people were murdered, was carried out by three Japanese terrorists arriving from Rome while the Maalot and Kiryat Shmona massacres two years later, in which 43 people (including 30 children) were killed, were perpetrated by terrorists coming from Lebanon as was the coastal plain massacre of March 1978, where 38 Israelis (including 13 children) were murdered. "Statistics: Fatalities in the First Intifada," B'Tselem, Jerusalem, accessed July 6, 2016. "Analysis of Attacks in the Last Decade 2000-2010," Israel Security Agency (ISA), Jerusalem accessed July 6, 2016; "Terrorism Deaths in Israel – 1920-1999," MFA. "Suicide and Other Bombing Attacks in Israel since the Declaration of Principles," MFA, accessed July 6, 2016. "Victims of Palestinian Violence and Terrorism since September 2000," MFA, accessed July 6, 2016. Arafat, interview with al-Anwar (Beirut), Aug. 2 1968. Al-Quds (Jerusalem), Dec. 22, 1995; Yigal Carmon, "So Now We All Know," The Jerusalem Post, Jan. 5, 1996. "2006 Summary—Palestinian Terror Data and Trends," ISA, accessed July 6, 2016; "Analysis of Attacks in the Last Decade 2000-2010," idem, accessed July 6, 2016; "2004 Terrorism Data," MFA, Jan. 5, 2015. "2006 Summary," ISA; "Analysis of Attacks in the Last Decade," idem. "Rocket Launching," ISA, accessed July 6, 2016; "Mortar shells launching attacks," idem, accessed July 6, 2016. See, for example, "Human Rights in Palestine and other Occupied Arab Territories. Report of the United Nations Fact-finding Mission on the Gaza Conflict," (Goldstone Report), U.N. General Assembly, Human Rights Council, Sept. 25, 2009; "Report of the independent commission of inquiry established pursuant to Human Rights Council resolution S-21/1," idem, June 22, 2015; "'Black Friday': Carnage in Rafah during 2014 Israel/Gaza Conflict," Amnesty International, July 29, 2015; The Independent (London), Dec. 17, 2014. Davar Rishon (Tel Aviv), Jan. 21, 1996; Maariv, Jan. 22, 1996. Tony Karon, "Clinton Saves Last Dance for Arafat," Time, Jan. 2, 2001. "The Promise, The Challenges and the Achievements: Donor Investment in Palestinian Development 1994-1998," World Bank and the U.N. Office of the Special Coordinator in the Occupied Territories, Jerusalem, 1999, p. 14; Jim Zanotti, "U.S. Foreign Aid to the Palestinians," Congressional Research Service, Washington, D.C., Mar. 18, 2016. "Resolution 1322 (2000). Adopted by the Security Council at its 4205th meeting on 7 Oct. 2000," U.N. Security Council, New York. See, for example, Hussein Agha and Robert Malley, "Camp David: the Tragedy of Errors," New York Review of Books, Aug. 9, 2001; The Jerusalem Post, July 26, 30, 2000; The New York Times, July 26, 2000. "The Palestinian war-torn economy: aid, development, and state formation," U.N. Conference on Trade and Development (UNCTAD), New York and Geneva, 2006, p. 37. "President Bush Calls for New Palestinian Leadership," White House Press Office, Washington, D.C., June 24, 2002. "Legal Consequences of the Construction of a Wall in the Occupied Palestinian Territory," International Court of Justice, The Hague, The Netherlands, July 9, 2004. Scott Wilson, "Obama Searches for Middle East Peace," The Washington Post, July 14, 2012. "The Prosecutor of the International Criminal Court, Fatou Bensouda, opens a preliminary examination of the situation in Palestine," International Criminal Court, Jan. 16, 2015. U.N. Watch, Geneva, Nov. 25, 2015. See, for example, Haaretz, June 13-17, July 11, Nov. 4, 2001, Feb. 26, 2002, Jan. 12, 2009; Ynet News, Apr. 25, 2010, Feb. 25, 2011. Haaretz, June 5, 2008, Jan. 22, 2009. The Marker (Tel Aviv), Feb. 16, 2007; Haaretz, Apr. 1, 2007. Havaad Haartzi Leroshei Harashuyot Haarviyot BeIsrael, "Hahazon Haatidi Laarvim Hafalestinim BeIsrael," Nazareth, 2006, pp. 5, 9. See, for example, Itamar Radai et al., "The Arab Citizens in Israel: Current Trends According to Recent Opinion Polls," Strategic Assessment, 18/2, Institute for National Security Studies, Tel Aviv, July 2015; Shibley Telhami, "2010 Israeli Arab/Palestinian Public Opinion Survey," Washington D.C., Brookings Institution, Oct. 20- Nov. 3, 2010. Haaretz, July 30, Oct. 1, 2001, Mar. 2, Apr. 3, 14, 15, Sept. 29, 2002, Oct. 9, Dec. 28, 2008, Jan. 12, 2009, Oct. 1, 2012. "Law Enforcement Officers Per Capital for Cities, Local Departments," Governing, accessed July 5, 2016. See, for example, Ali Abunimah, "When Salam Fayyad secretly urged the US to block salaries to Palestinian Authority employees," The Electronic Intifada, Oct. 4, 2012; The Jerusalem Post, May 5, 2012. Jonathan Schanzer, "Chronic Kleptocracy: Corruption within the Palestinian Political Establishment," Hearing before U.S. House Committee on Foreign Affairs Subcommittee on the Middle East and South Asia, Washington, D.C., July 10, 2012, pp. 17-8; Bergman, Veharashut Netuna, pp. 162-3; Rachel Ehrenfeld, "Where Does the Money Go? A Study of the Palestinian Authority," American Center for Democracy, New York, Oct. 1, 2002, pp. 9-10; Yediot Ahronot (Tel Aviv), July 14, 2002. See, for example, "A Poorer Peace," Newsweek, Sept. 1, 1997; Keith Marsden, "The Viability of Palestine," The Wall Street Journal, Apr. 25, 2002; Patrick Clawson, "The Palestinians' Lost Marshall Plans," The Jerusalem Post, Aug. 9, 2002. 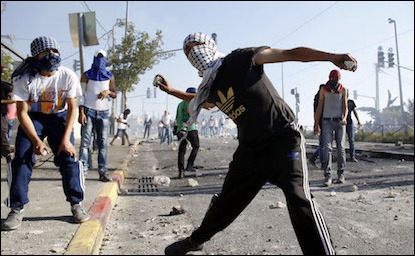 "Four Years—Intifada, Closures, and Palestinian Economic Crisis. An Assessment," World Bank, Washington, D.C., Oct. 2004, pp. xv, 3, 9. 13, 29-32; "Assistance Strategy FY15-16 for the West Bank and Gaza," idem, Oct. 8, 2014, pp 3-5; "Economic Monitoring Report to the Ad Hoc Liaison Committee," idem, May 27, 2015. The Guardian (London), June 21, 2004. Related Topics: Arab-Israel conflict & diplomacy, Israel & Zionism, Palestinians | Efraim Karsh | Fall 2016 MEQ receive the latest by email: subscribe to the free mef mailing list This text may be reposted or forwarded so long as it is presented as an integral whole with complete and accurate information provided about its author, date, place of publication, and original URL.